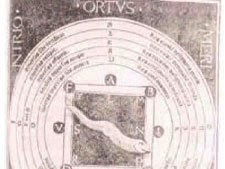 The 1482 work [Artes orandi, epistolandi, memorandi] included the first printed artificial memory, though it depends heavily on antique sources. 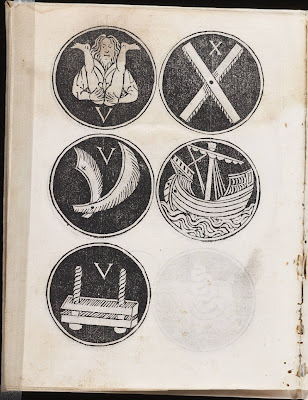 This form of meditation related loosely to Llull's method for remembering the truth, as both his divine and Publicius's figural alphabet could be used to construct mnemonic concepts. 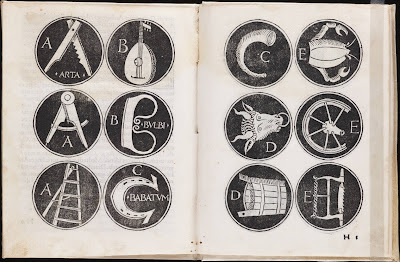 Llull's letters were meaningful in themselves, whereas it was the act of rotating Publicius's dial to connect characters from his visual alphabet that produced memorable patterns. His serpent-shaped pointer is the first of many diagrams that reinforced the significance of their calculations by furnishing the moving parts with their own visual connotations. The snake pictured [below] comes from the Lessing J. Rosenwald Collection at the Library of Congress. I'm having trouble finding more easily accessible information on this book online; any leads would be appreciated. The 1482 is also online, I have it on my computer, but can't remember the source. Maybe some Spanish digital library.